Got some old newspaper and a beach ball laying around? 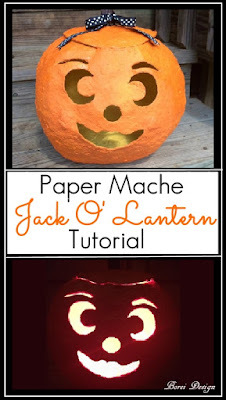 Why not make a cute, reusable paper mache Jack O' Lantern to welcome trick-or-treaters to your home this Fall? First I partially inflated a the beach ball and tied ribbon around it to create ridges. 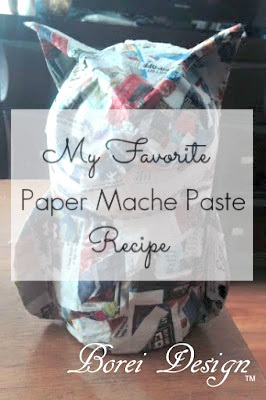 I then added newspaper strips dipped in paper mache paste. Make sure to put the air valve at the bottom and leave that area open. Add at least 4 more layers allowing it to air dry completely between each layer. 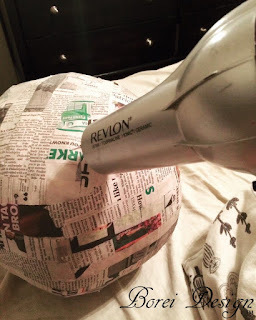 Although I did not do it this time, I strongly suggest that you use paste dipped strips of fabric or un-dipped, dry, regular duct tape for one of your middle layers. 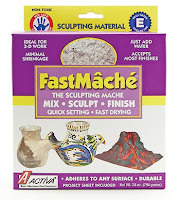 This will give your armature (or base form) more stability and help to prevent warping. DO NOT put the papered ball in the oven to dry or you will end up with a melted mess. However you can use a hair dry set on high heat to help dry any stubborn spots. Once all the layers were completely dry I (literally) sucked the air out of the ball from the valve and pulled the deflated ball out from the bottom. I spared you from a photo of me actually sucking air out of the beach ball for your own good. I then drew and cut out the facial features, a large top circle (to create the pumpkin lid) and a small hole in the back as opening for an electric cord. 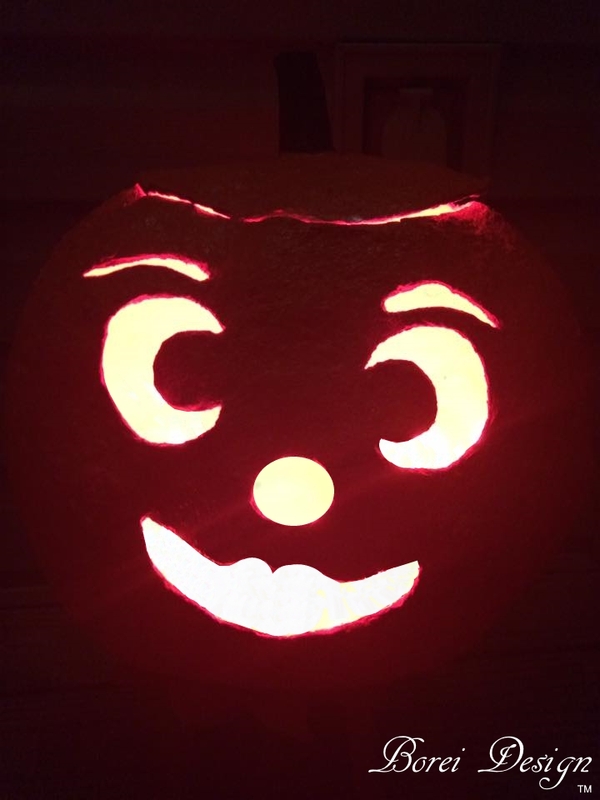 I traced around a lid from a bowl to draw out the shape of the circular pumpkin lid. 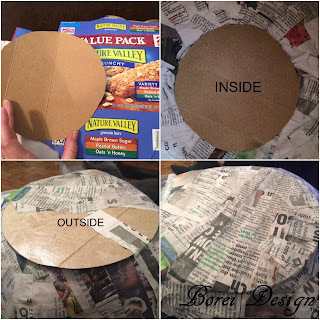 Next I grabbed some cardboard boxes from the recycle bin and cut out two circles. I hot glued one on the inside bottom and one on the outside bottom of the Jack O' Lantern. 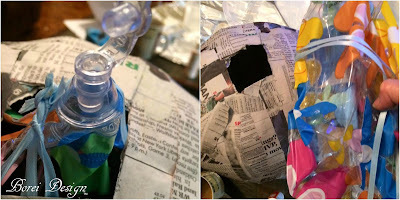 This helps to secure the form and cover the hole previously left for removing the beach ball. I then covered both circles and my cut out areas with a couple of layers of paste dipped strips, drying between each layer. 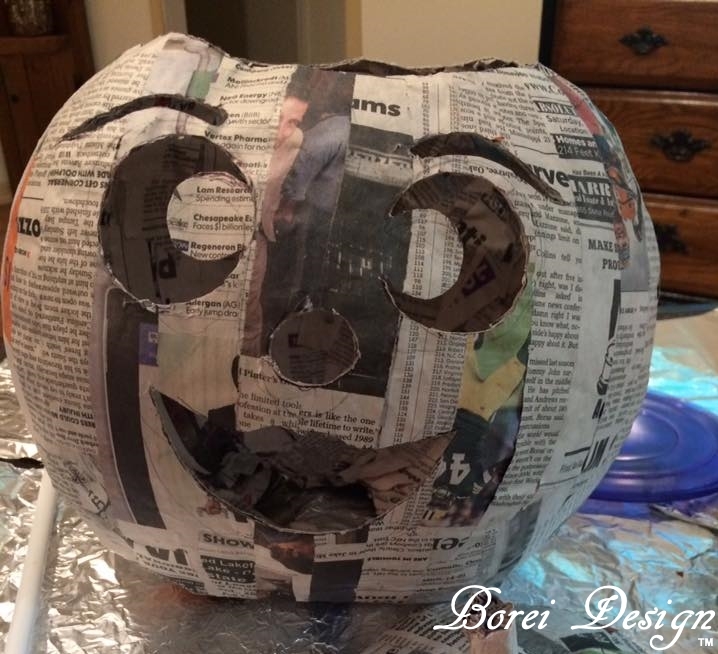 I made the stem by twisting newspaper and adding a little white (school type) glue in the folds. I cut off the length I wanted it and hot glued it to the top of the lid. 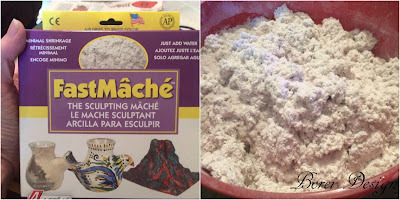 I then mixed up my Activa Fast Mache paper clay in a large bowl and transferred it into a large freezer bag for storage in the fridge between use. It's super easy to mix up. All you do is add water and kneed. 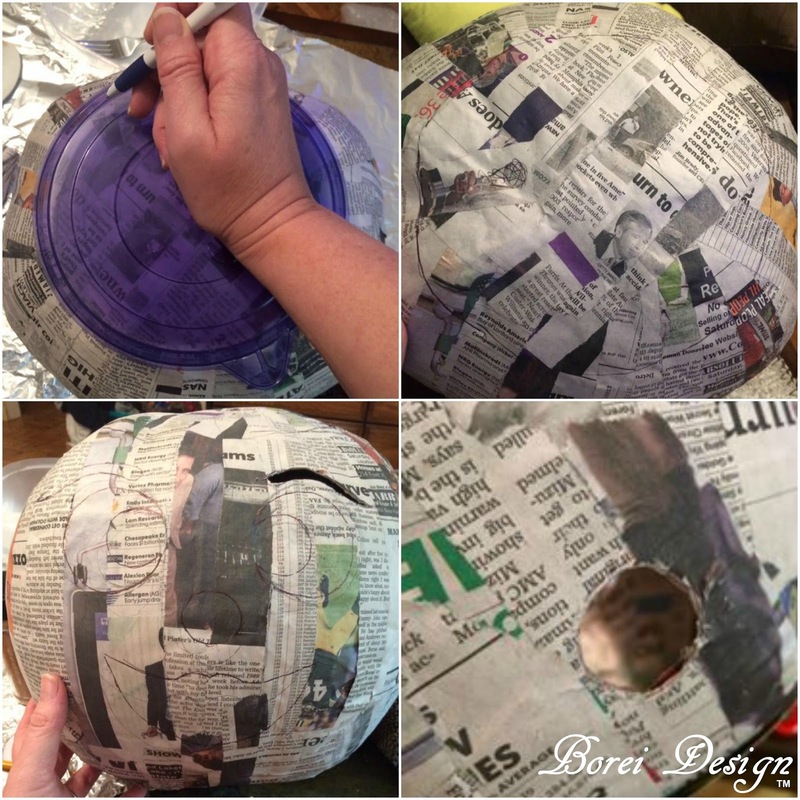 I added the clay to the entire pumpkin (including the lid) with my fingers. I added it to the entire outside first, allowed it to dry and then added it to the inside. You can use the oven to help with drying time but be cautious when doing so. If you dry it too fast at high temperatures you can cause it to crack. I left mine to dry over night and to finish it up, I put it the oven on the lowest temperature possible (170 degrees F for mine) and checked it every 20 minutes. 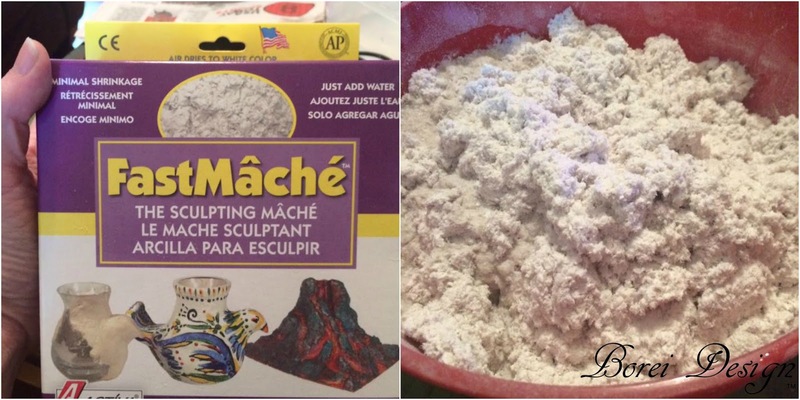 Once it is dry you can use sand paper to smooth out the features or any rough spot. I rarely do this to mine because I like the rough texture. 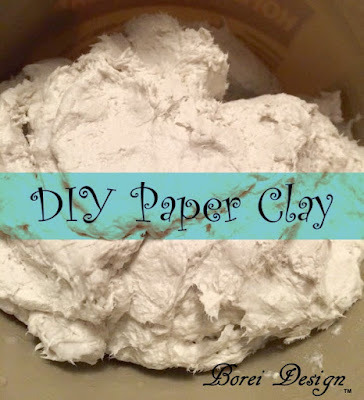 I usually only smooth out really bumpy areas of the paper clay with damp fingers before drying. 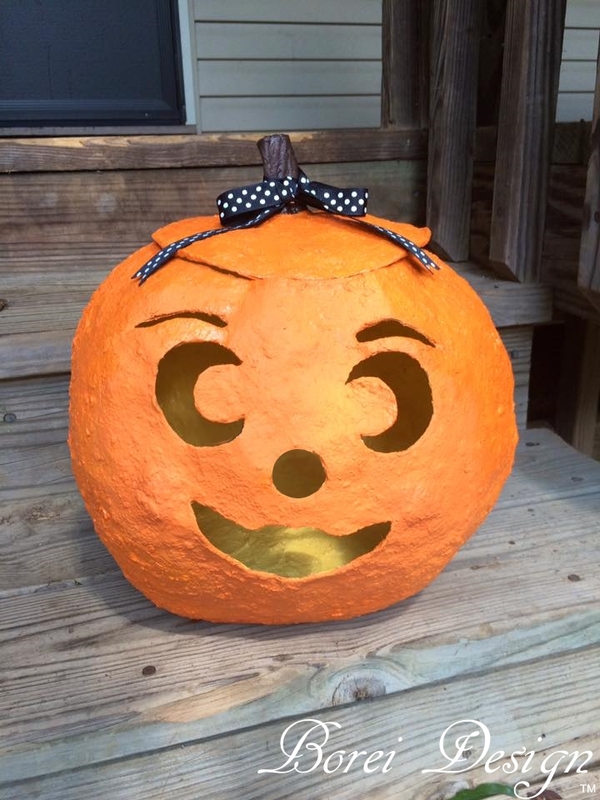 I then painted it inside and out using acrylic craft paint. Once that was dry I added a couple of layers of the clear spray paint to help finish and seal it. 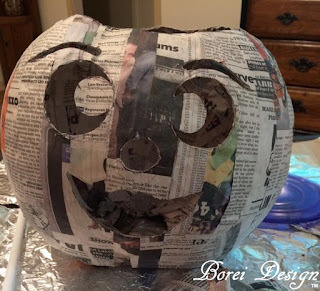 Even though it I used indoor/outdoor spray paint I still recommend you use your paper mache Jack O' Lantern on a covered porch on and not expose it directly to rain. I love how the yellow paint reflects the light. In the pic below it sitting below a lamp only. 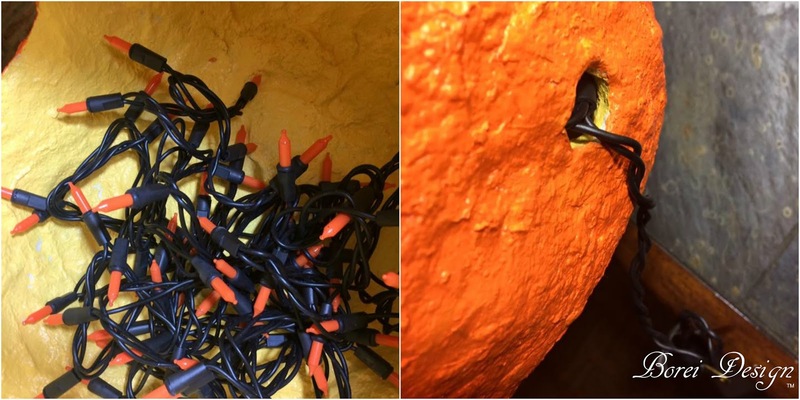 Once the spray paint was dry, I added a strand of lights to the inside (with plug coming out the circular opening in the back) and I was all done. As previously mentioned you can also use a flameless candle instead. I'm super happy how he turned out. 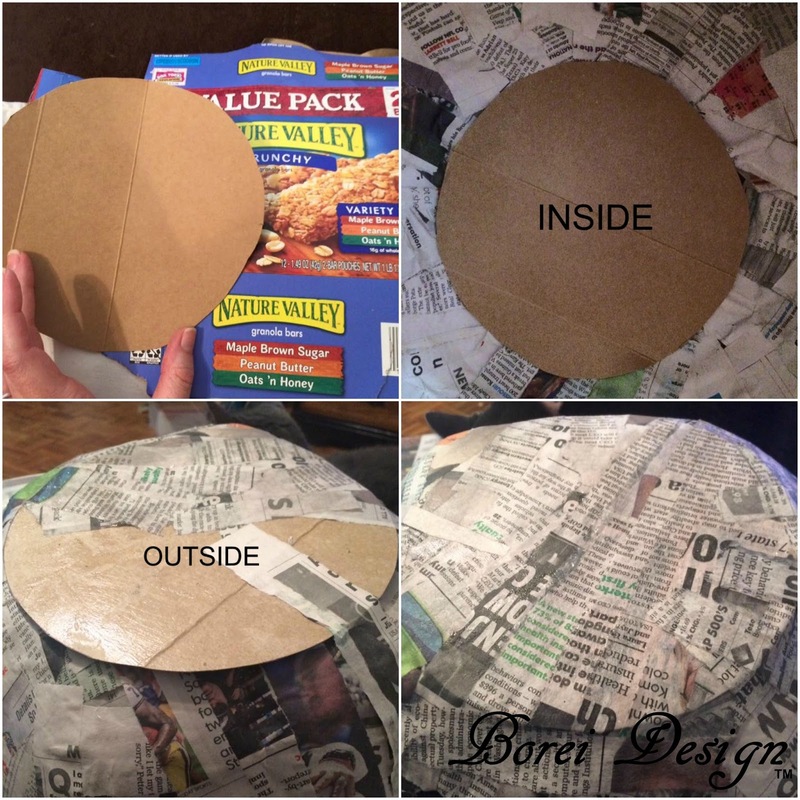 I hope you enjoyed this tutorial and inspires you to make your own version. Until next time, Happy Fall, Y'all! This is such a creative idea! I love it!! i don't do much for Halloween and carving an actually pumpkin wuld be a nightmare but this is something i could defo do! I made one of these with my son - boy was that a long time ago. Maybe I will make one for my porch this fall. 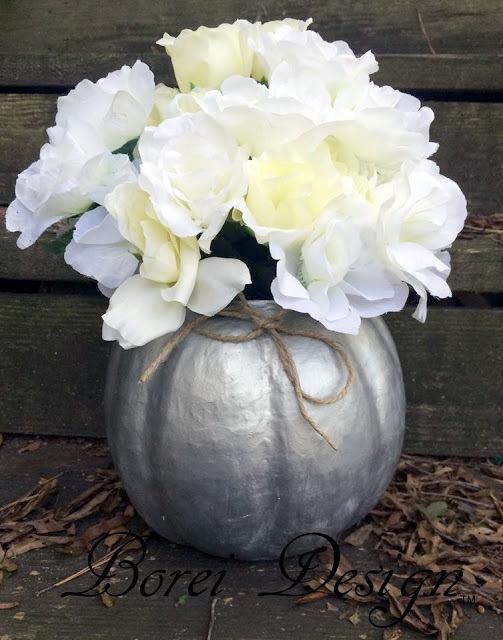 Oh now that is such a cute little jack o lantern, I love the fact that you could DIY it so easily and pop in some fairy lights, perfect for October. This is such a fun idea. I need to make one of these with my kids. What a fun way to use the ball. 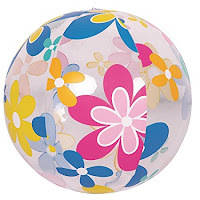 Everyone's got a beach ball hanging around the house! I haven't made a paper mache craft in entirely too long. I think it's time to change that and show my grand kids how fun it is to create with it. 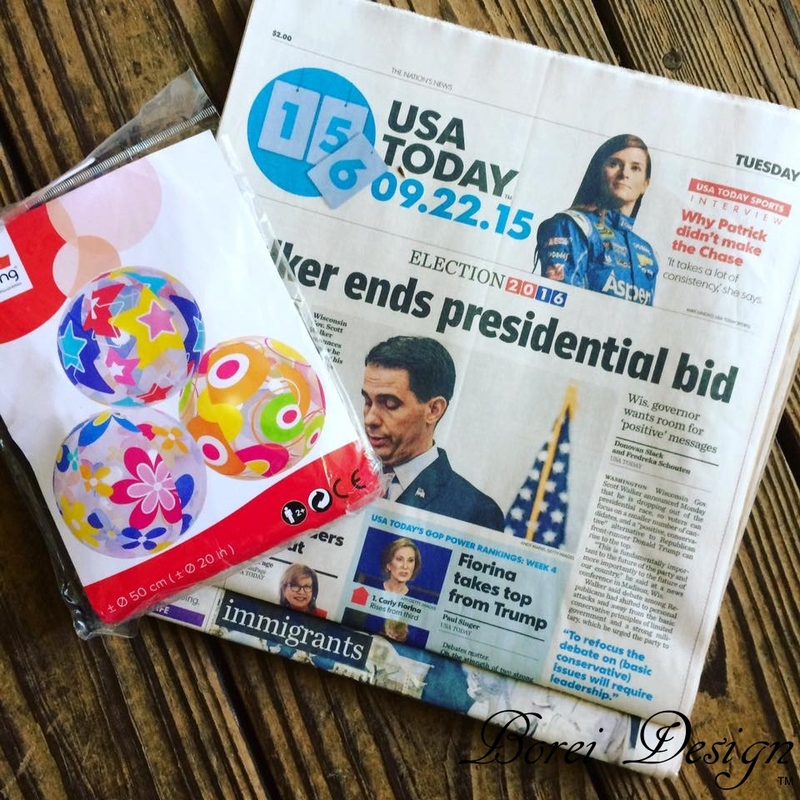 This is such a cute and fun project, I just love it!! My son is all grown up now and I can't wait until he and his wife have a child for me to do this kind of project with. Awesome job, very creative! I like the final look. It will be fun to make on with my niece. 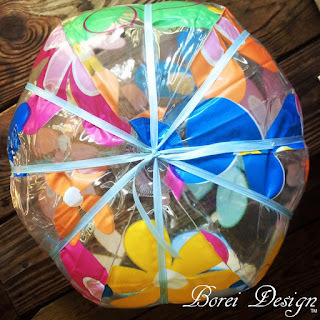 Love this DIY, I am not good at making lanterns but want to give this one a try. What an adorable project. I love doing neat things like this with my kids. I think I am going to make this one this weekend. This is such a cute idea! I can't wait to try it for myself. I bet my daughter is going to have a blast with this! Your jack-o-lantern turned out so cute! Great idea to use the beach ball as a base. I've only ever done paper mache on a balloon. Very clever. What a smart idea!!! So cute and fun to do with the kids. I am pinning this for future reference. I will definitely have to be showing this to my daughter. 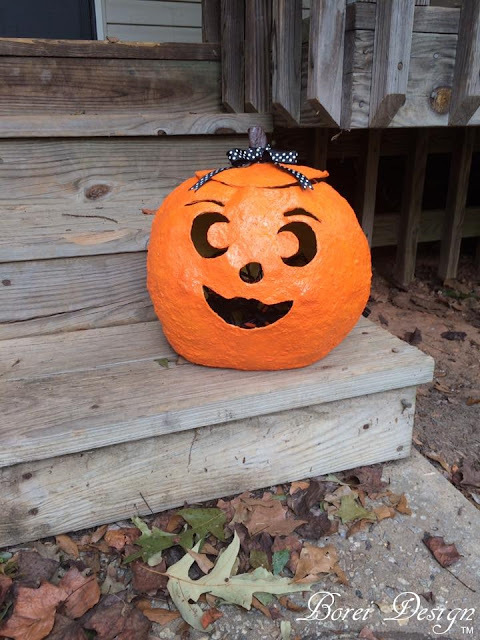 She loves crafts and we always have a hard time keeping our Jack O Lanterns to stay healthy. They always rot too quickly. This is a really great idea for kids and parents to do together. Great it's something that you can keep for years to come if you keep it free from water and such. What a cute idea! 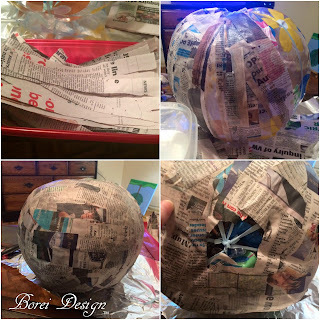 I haven't done anything with paper mache since I was a kid! 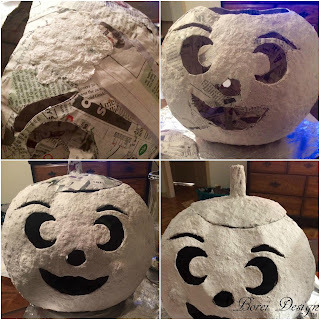 This paper mache Jack-O-Lantern tutorial craft. I would love to make these with my niece and nephews who I know would love doing them. Thanks for sharing the tutorial.